Mostly covering the Prapat Agung Peninsula and a small offshore island called Menjangan, the 190 acre park is an important natural reserve. There are over 160 species of bird here including the nearly extinct by Bali starling. This bird was the reason the park was created in the first place. Other animals you can expect to find here include Indian muntjac deer, Wild boar, leopard cats and Javan Rusa. There are two activities to partake in at the park and it is hard to do both of them on the same day. You can either hike or explore the Park's Forest Trails (having an official guide is mandatory). The trees are more deciduous than tropical. And you can go snorkeling and diving in the waters around Menjangan Island. You can also take a boat out to Gilimanuk Bay. A very small percentage of the Park is open to the public. Check in at the park PHPA office for directions. You can find them at the village of Cekik, and at Labuan Lalang. Usually the best way to check this National Park is by guided to her. The best time to visit the park is between August and December. Snorkelling or diving expeditions around the park must be arranged for at the Labuan Lalang Station. Bring your own water, lots of it. Permits to enter the park for hiking cost RP40000 and can be had at the ranger stations. Guides: Rp.350,000 for a two hour hike. Entry Fees: Rp 200,000 per person. Gilimanuk Bay trips + guide: Rp 450,000 per hour. It take 2 hours to cover any one trail or trip of the park. Get to Menjangan Island via chartered boat from the beach at Labuan Lalang. How popular is West Bali National Park? People normally club together Soka Beach and Pantai Cemara while planning their visit to West Bali National Park. It's one of many beautiful national parks in Indonesia. Right here you will find many animals that hard to find everywhere else. There are macaca monkeys, venison, tropical birds, etc. Even if you just go to Bali to visit this park, I guarantee you won't be disappointed. 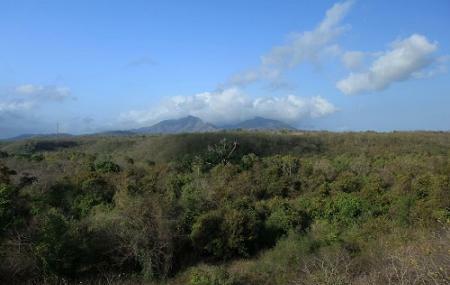 West Bali park is a huge green area that is good for hiking, birdwatching and being around wild animals. We went on a weekday and paid 200k entrance fee each. We didn’t want to take a guide so we’re not allowed to go to the east part of the park: they said it’s too dangerous and we could get lost there without the guide, too many routes; and of course the most interesting things are there so they force you to take a guide and pay double price for a boring lecture. No, thanks, I can do hike myself, I’ve been doing it in South America, Russia and Europe and West Bali park is nothing even closer to a “dangerous place”. So we didn’t take the guide option and went by motorbikes to the west part of the park. The road is bumpy and I don’t recommend to go by scooter, better do hike or get a proper motorcycle. We drove a little bit, then parked and hiked for about 1,5-2 hours. We got lucky and saw a few black monkeys, one barking deer crossing the road and it was like out of blue😂We also saw some black-n-red crabs and many green monkeys that you can see everywhere in Bali. That was really cool. But: I give this place 2 stars because of bad maintenance. It seems like the staff only cares about collecting money from bules and they do nothing to keep the area clean and protected. It was a ton of rubbish in the sea and in the park, of course staffs blamed tourists and Javanese people throwing rubbish on their territory (like Balinese people are innocent), but if you collect money to maintain the territory: then DO it. Design proper information boards and maps, educate people, fine people for throwing rubbish, clean the beach and park territory every day rather than sit, complain and do nothing. I was really upset about seeing the park like that, and at least I was happy that they didn’t let local people cut the trees and build hotels there, so those poor birds and animals still have a home. A polluted home. Very nice, but slightly expensive, national park. We had an awesome tour guide and apart from the local deer saw all the wildlife you can imagine. a great destination for your holiday. Offering a beautiful wildlife on the land and the underwater!